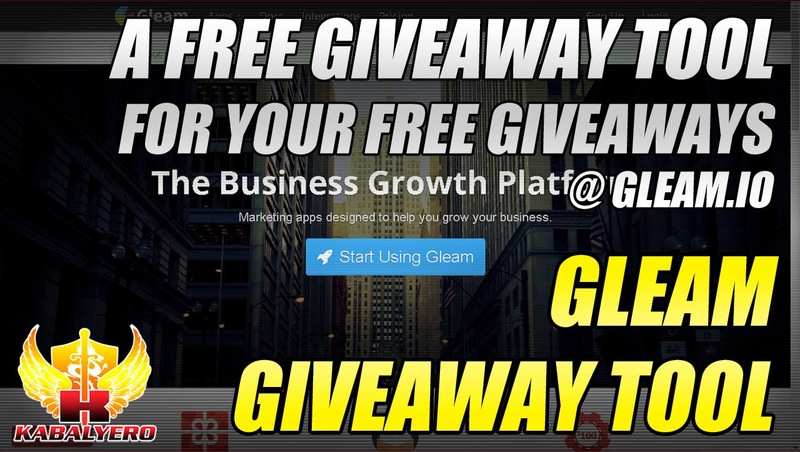 Gleam Giveaway Tool, A Free Giveaway Tool For Your Free Giveaways @ Gleam.io - KABALYERO - PLAY, BLOG & EARN! Gleam Giveaway Tool, here is a free giveaway tool for your own free giveaways in 2015. Do you guys enjoy doing giveaways? If you are then you may want to check out Gleam or Gleam.io. So, what is Gleam? Gleam is a website where you can setup and run your giveaways. Setting up a giveaway in Gleam is easy and you can use for free. In fact, I'm currently using Gleam in one of my giveaways and I was able to setup that giveaway without any problems. If you're interested in checking out that giveaway then the link to it is in the description of this video. There are other websites that offers the same service as Gleam like Rafflecopter and Giveaway Tools and these websites are great as well but the thing that attracted me to Gleam is the amount of options available to Free Users. Some of these options are also available in other websites that offers the same service but most of them are locked or only available to paid users. As a Free Gleam User, getting a lot of cool options is wonderful because it lets me setup my giveaway the way I want to. Check out Gleam @ http://bit.ly/1ImfVwR.